I have just been introduced to this organisation which is promoting independent shop traders in Bristol. 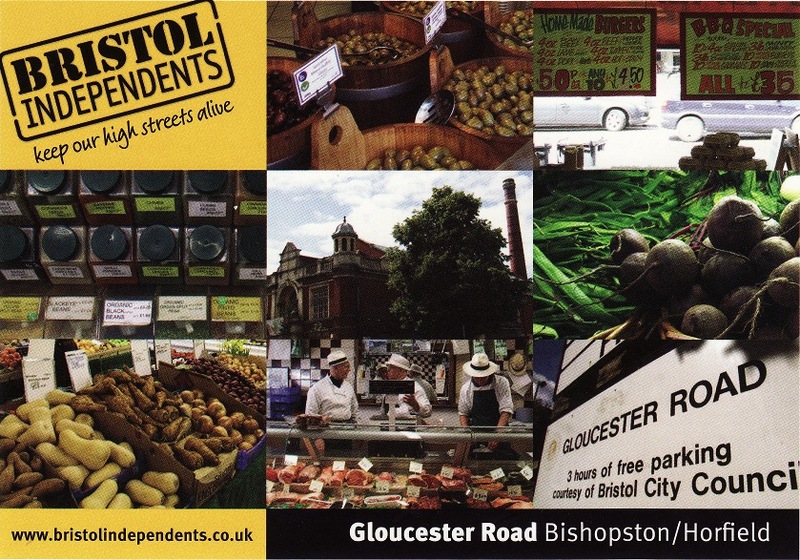 They have produced a series of six recipe postcards, one for each major shopping thoroughfare in Bristol. This is the Gloucester Road one and I have also seen the Whiteladies Road one. Each one has on the back a recipe supplied by locals and which can be easily made from ingredients purchased in a short walk down the road rather than a car trip to Jamie’s or Delia’s emporium. Look out for them in your area. See my post from July to learn more about this fascinating street. This entry was posted on 3 Oct 2011 at 22:53	by Rick	and is filed under Miscellaneous. You can follow any responses to this entry through the RSS 2.0 feed. Both comments and pings are currently closed.